Do you promise not to tell? I’d say I’m neither really good or really bad at keeping secrets. Sure, some are easier to keep than others. For instance, who really wants to know that when I was 13 I planned out every single detail of my wedding to Steve Perry? The combination of reading Judy Blume’s Forever and constant listening to the Journey album Frontiers set my teenage imagination into overdrive. But other secrets, like Anne Burrell’s Stewed Lentils with Bacon, demand to be shared. I’ve tried a few lentil recipes recently in an attempt to learn to love them; each ending up in a heaping plate of disappointment. One thing they all had in common was French Green Lentils. Despite having the likes of Harris Teeter, Wegman’s, and The Fresh Market at my disposal, I couldn’t find French Green Lentils. So I’d use ordinary Green Lentils instead. And I consistently got mushy, blah results. Then I was wandering through the aisles of Whole Foods, for what I can’t remember but for some reason I thought I could only find whatever it was there, and hidden away in the bulk foods corner were FRENCH GREEN LENTILS. Much quiet rejoicing and scooping promptly ensued. The timing of this couldn’t have been an accident because I had just watched Anne Burrell fix Stewed Green Lentils on her show Secrets of a Restaurant Chef. Then, as if I needed another nudge from the Universe to get me moving, Adam over at The Amateur Gourmet blogged about them. Yes Universe, message received. And at long last, my efforts were rewarded. These lentils didn’t turn to mush even after 25 minutes of low cooking and a long soak after the heat was turned off and the water was salted. I was concerned during the cooking to see very unappealing foam in the water. But thanks to some freakish surface tension, it easily skimmed off. My other moment of indecision came when the bacon was rendering. Should I really have used 2 tablespoons of olive oil to cook the bacon? Because the olive oil plus the fat that rendered out of the bacon equaled a LOT of hot, splattering, grease. Thankfully, almost all of it was absorbed by the diced vegetables that got added to the skillet. What did remain mixed beautifully with the vinegar and mustard to form a sort of hot dressing. A heaping bowl of Stewed Lentils makes a hearty meal. Don’t tell anyone but I liked them even better the next day when I added them to some simple butter lettuce for a salad. I hope Anne Burrell doesn’t mind that I’ve shared her secret to Stewed Lentils with you. But I’m thinking maybe I should have kept that Steve Perry thing to myself. BAH Tip: Anne made her thyme bundle by using ordinary kitchen string to tie together a bunch of thyme. I didn’t have any string but luckily my thyme came in very long pieces. I gently tied them in a knot. I was tempted not to use the fennel because the idea of adding something that tastes like black licorice makes me scrunch my face and go ‘yuck’. I’m glad I did use it because the lentils had incredible flavor that in no way resembled a box of Good N Plenty. Combine first eight ingredients (lentils through 2 cloves garlic, smashed) in a large pot. Add water to cover the ingredients by about 2 inches. Bring to a boil over medium heat, then reduce heat to a simmer. Cook for about 20 to 30 minutes or until the lentils are soft. Remove the pot from the heat and season the water generously with salt. Taste the water to make sure it is highly seasoned and let the lentils sit in the salty water for about 10 to 15 minutes to absorb the seasoned water. Ladle off 1 cup of the lentil cooking water and reserve. 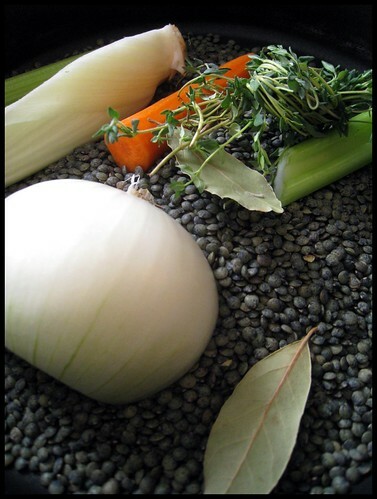 Remove and discard all the vegetables and aromatics from the lentils. Strain the lentils from the water. Place 2 tablespoons of olive oil in a large saute pan over medium heat and add the bacon. When the bacon has rendered off a lot of fat and has become brown and crisp, add the onions. Season with salt and cook until they become very soft and aromatic. Add the diced celery, fennel, and carrot. Cook over medium heat until the vegetables start to become soft and fragrant, 2 to 5 minutes. Add the chopped garlic and saute for 1 to 2 minutes more. Add the cooked lentils, 1/4 cup of the reserved lentil cooking water, mustard and vinegar. Cook until most of the liquid has reduced. Taste for seasoning, adding more salt or vinegar if needed. Serve hot or at room temperature. Cooler weather always inspires me to make a batch of lentil soup. It’s one of my favorite meals. Nothing fussy. Just a nice bit of garlic, shallot, carrot, celery, water, lentils and salt/pepper to taste. Perfect comfort food. I’ve made this dish twice now and I definitely like them better as leftovers. Maybe I’ll give lentil soup a try.